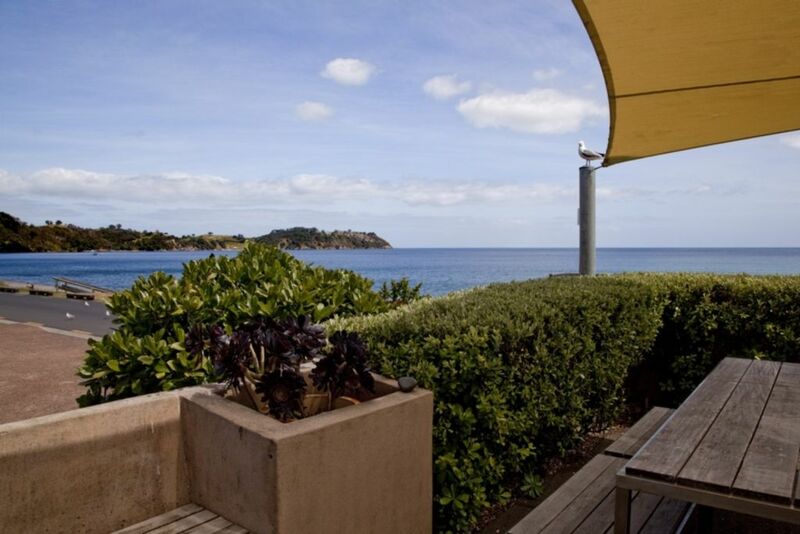 Prime beachfront position on Waiheke Island. Across the road from Onetangi beach. Spacious indoor and outdoor living. Terrace overlooks beach. Grounds are fenced but front wall has an mechanised shutter which when open looks to Little Barrier. BBQ in private garden and sunny patios. Listen to the waves. Newly renovated large bedroom / living area upstairs with splendid views of beach. It has a new Imperial Pillow-top Queen bed. Second bedroom has a King splittable bed. Spa pool. Sky TV and DVD. Modern kitchen and appliances. Large adjacent section for parking. Children's playground nearby. Onetangi beach is almost 2kms of white sand. Safe swimming. A "Forest and Bird Reserve" nearby offers walking tracks to all levels of fitness. The popular Zip -Line is nearby. There are two cafes and a bus stop within a stones throw. Facing north with views of Gt Barrier and Coromandel. Plenty of room to spread out and relax. Kayaks and paddle boards are available for hire. Pets are allowed with prior approval. They must be kept off beds and furniture. New massaging spa set in lush garden, new Imperial Pillow top Queen bed, BBQ andamp; 2 outdoor patios. Looks north to Little Barrier, Gt Barrier and Coromandel. Looks east and west along the beach from upstairs bedroom. Living area looks north to the beach and waves with wall shutters for privacy. Walk across the road to beautiful Onetangi beach, 2kms of golden sand. Occasional surf but mostly a very safe swimming beach. Perfect for paddle boards, kayaks, fishing. We enjoyed our stay at this fabulous property situated perfectly on the Strand across the road from beautiful Onetangi beach. This home is a gem for a wonderful holiday on Waiheke Island and we would love to return with our family. It is close to the beach, restaurants and the bus stops just around the corner to take you to vineyards, restaurants and shops etc. We hired a V W convertible from the Onetangi Beach apartments, situated at the rear of the property, for a day of of fun exploring the island. Highly recommend! The home is well appointed and spacious and the newly refurbished upstairs bedroom/en-suite has created a lovely space to enjoy the spectacular views over the bay. The spa and outdoor living areas are fabulous too. So pleased we found this property! Thank you Susan for your kind words, You are just the people we enjoy sharing our place with. Thank you for leaving the house as you found it. So pleased your experience on Waiheke was the best. Hope to see you again. We loved the house and proximity to the beach. Very spacious well equipped house. Had everything we needed. The apartment was just what we wanted. Lots of room, all the features you could ever need, including great book selection for rainy days, except the sun kept shining. Just over the road from the beach and only 10 mins. or so from most of the island, except that it was too easy just to sit back and enjoy the location. This property is excellent. The 2 level living/sleeping ensures that there is plenty of space. It is extremely well equipped with spa, full kitchen, bbq, herbs and salads in the garden, raised deck area, sun loungers, full media room, 3 bathrooms, stunning day bed and more! But best of all was the location. Just stunning. Wake up in the morning, open the louvre windows in the wall and watch the world go by. Alison was a delight to deal with and sorted out our minor issue on arrival despite being in Russia! We absolutely loved it and can't wait to go back. We’re so pleased you enjoyed staying in our house as much as we do. Waking up to Onetangi beach is always a great start to the day. We really appreciated your understanding of the house-keeping oversight. You’re most welcome to return. Thanks Carla. Pleased everything worked out well for you. Thanks for leaving the place in good order. It’s very difficult when you have young children and lots of gear. Have a good year. We loved this property! The location is fantastic, easy walk between two great cafe's, 2 mins to the bus stop and literally across the road from the beach. The apartment itself is huge with everything you could possibly need, even if the weather is bad! There is Sky TV, two living areas, plenty of books or magazines to read, plenty of space to just hang out. There is a covered deck with ocean views, sun lounges in the garden and all mod cons in the kitchen and bathrooms. Fantastic place! Three restaurants within a few minutes walk. Forest and bird park is 10 minutes walk.